A cataract patient waited for surgery in 2011. In recent years, more than two dozen Massachusetts patients have been victims of medical errors during cataract surgery — a wildly popular procedure that is now the most commonly performed operation in the country. The patient safety agency that tracked the errors said these types of mistakes are largely preventable when staff rigorously follow safety protocols. 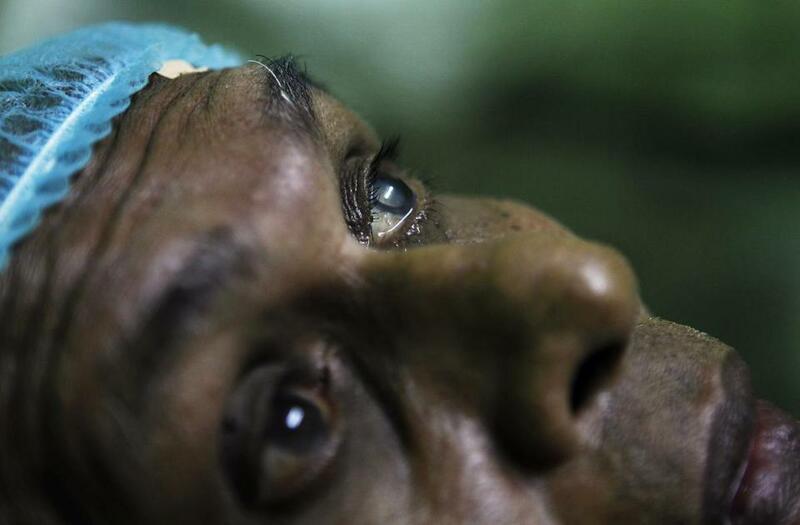 But cataract removal has become so routine — and is considered so safe — that doctors and nurses may sometimes let their guard down. The Betsy Lehman Center for Patient Safety and Medical Error Reduction, an independent state agency, documented 28 serious errors that were reported to Massachusetts health officials between 2011 and 2015. They included implanting the wrong type of lens, anesthetizing the wrong eye, and injecting nerve block in such a way as to cause permanent vision loss. In a shocking case in 2014, five patients were harmed — several suffering vision loss — in a single day as a result of blocks injected by an anesthesiologist on his second day of work at the facility. The Lehman Center identified six additional major complications reported to the Board of Registration in Medicine during the last two years. While similar national data are hard to come by, several organizations maintain databases of errors voluntarily reported by providers that “strongly suggest that the types of adverse events that facilities have reported in Massachusetts are no different than those occurring throughout the country,’’ according to a report the Lehman Center planned to release Thursday night at a meeting of the Massachusetts Society of Eye Physicians and Surgeons, a partner in the initiative. While caregivers strive for no errors, Dr. Michael Repka, a surgeon and an official with the American Academy of Ophthalmology, said that incidence of errors described in the report is still very low. “We should not incite fear in the public,’’ he said. Still, the Lehman Center report pointed out, these types of errors should not happen at all, given the effectiveness of “time outs’’ before surgery and other prevention measures. Half of Americans develop cataracts that cloud their vision by age 75. There were nearly four million procedures last year, including at least 62,000 in Massachusetts. During the operation, an eye surgeon removes the person’s natural lens and replaces it with a clear manufactured lens. It usually takes under a half-hour, and many patients experience dramatic improvement in their vision. “When you are talking about four million a year, even tiny rates of error turn into big numbers of patients harmed,’’ said Barbara Fain, executive director of the Lehman Center. Last year, the Massachusetts Department of Public Health saw an increase in “serious reportable events’’ during cataract surgery from hospitals and outpatient surgery centers, prompting the Lehman Center to study the problem. It partnered with the state organizations of eye surgeons and anesthesiologists to increase awareness of the risks and promote best practices. In a dozen interviews with surgeons, the Lehman Center found that errors such as implanting lenses of the wrong strength or model were not even on most of their radar screens. Most doctors were more concerned about complications like infections and retinal detachment. Nicola Truppin, 60, was invited to join a panel of experts advising the Lehman Center. She had cataract surgery more than a year ago and owns a business to help patients navigate the health care system. In reviewing error reports sent to the health department, she was surprised that caregivers often did not appreciate how mistakes affect patients. For example, one report described how doctors injected nerve block into a patient’s left eye when they should have numbed the right eye. “No harm was done to the patient,’’ the summary said. Truppin suggested the panel broaden the definition of harm, and they agreed. Caregivers routinely hold “time-outs’’ before procedures to check that they have the correct side, procedure, and patient. But the Lehman Center said many errors appear to be the result of ineffective time-outs, when staff are rushed or distracted. “The surgeon would come in and say ‘I have to be out of here by noon, so let’s get going,’ ” said a nurse at a hospital surgery center who was quoted anonymously in the report. The Lehman Center report recommended that providers take three distinct time-outs: when the patient arrives in the pre-operative area, prior to a nerve block, and prior to surgery. Poor handwriting appeared to cause other mistakes that weren’t caught in advance of surgery. Last year, a patient went home with a +12.50 power lens instead of the +17.50 power lens the surgeon had intended to implant. On a handwritten order slip sent from the surgeon’s office to the surgery facility, a 7 resembled a 2. Dr. Matthew Gardiner, an eye surgeon and associate chief for operations at Massachusetts Eye and Ear Infirmary in Boston, said it switched to electronic lens order forms more than a year ago, eliminating mistakes caused by unclear handwriting. Fain said the group was not able to determine why five patients were harmed in one day in 2014. A nurse who worked at the ambulatory surgery center seemed baffled. “Even if it was one patient, it would have been upsetting. But five? Five in one day? It was hard to wrap your head around that. How did this happen?’’ she said in an interview with the Lehman Center. The center recommends that facilities be extra vigilant when they credential new doctors, especially in outpatient surgery centers, which often rely on temporary nurse anesthetists and anesthesiologists. The agency report said facilities cannot depend on companies providing the staff to make sure they are trained well and have proper orientation. They should closely observe an anesthesiologist performing about 10 blocks before allowing the doctor to do the procedure independently, the report said. The Lehman Center also advised doctors to use the least invasive form of anesthesia appropriate for the case. Topical numbing drops have the lowest risk of eye injury, but Massachusetts doctors appear to have been slow to move away from injected nerve blocks, which last longer for more complex cases but can harm eyesight if used improperly. Fain said doctors need to discuss the options more extensively with patients.